There is something beautiful about a concert. Even with the amazing technology available in studios today, it’s still impossible to capture the essence and spirit of the live performance. 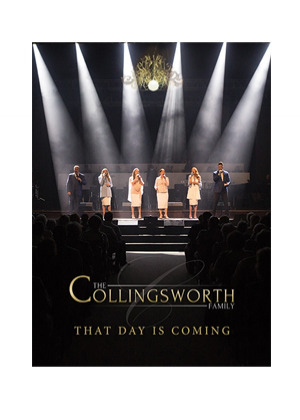 While critics and industry professionals have applauded the quality and innovative recordings of the Collingsworth Family, they all agree that something even more special happens while attending their concerts. Due to the overwhelming radio and tour success of the recording, That Day Is Coming, it quickly became apparent that a full-length concert recording was in order. On April 21, 2017 in front of a sold-out audience at the beautiful First Wesleyan Church in High Point, North Carolina, the accompanying DVD was recorded, complete with a live band and members of the Greensboro Symphony Orchestra. Now everyone can witness the beautiful harmony and experience the worship time and time again.